ClickInks, as the name suggests, is an online retailer and distributor of toner cartridges and ink cartridges at unbeatable prices, from brands like Hewlett Packard, Dell, Epson, Kodak, Samsung, Sharp, Lexmark and Canon. The company focuses on providing the best value of ink, which is both cost efficient and long lasting. You can save up to 86% on all your printing needs. Also, you can buy two cartridges of Canon, Epson, HP, Dell or Brother, and get the third one absolutely free. Moreover, if you order two packs, shipping charges are waived off. Universal Round Ring Economy Vinyl Binder 2"
When making purchases or using services online you'd be surprised how many special offers and discounts are available. At Coupofy Coupons we collect them all in one place so you don't have to spend hours searching the web! Our Click Inks coupon codes can be redeemed today, simply click one you want to use and you will be taken directly to the website where you can apply the code during checkout. However, PayPal Checkout is chosen by most of the customers because it is secure, convenient as well as an easy mode of payment. Ground shipping is free for all orders amounting to more than $40 and the shipping is done through US postal service mail and United Parcel Service (UPS). Orders less than $40 come with a flat fee of $5.95 and can take up to 3-7 working days for delivery. Free shipping is not valid for P.O boxes and FPO/APO addresses. Expedited shipping options are available in the form of 3rd day, 2nd day and Overnight delivery, only available for 48 contiguous states of U.S. In case you are not happy with the item you purchased, you can request for a return within 30 days from the date of purchase. 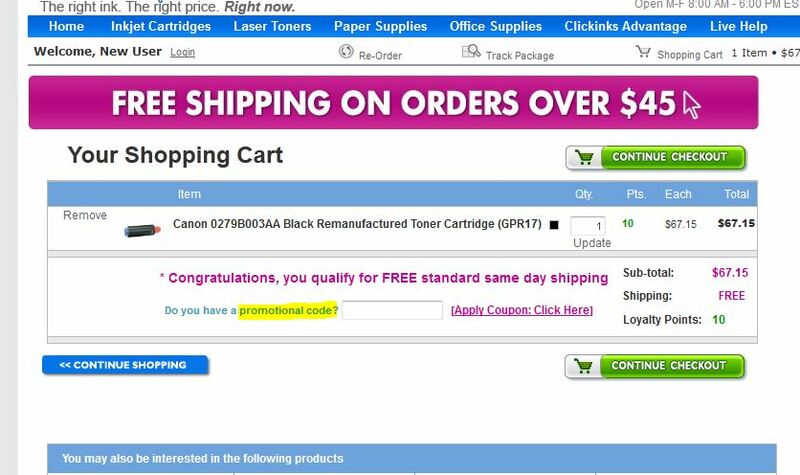 In this case, ClickInks will provide return shipment through a pre-paid label. If you cross the 30 day threshold time, you may not be entitled for free return shipping through the prepaid label. In order to assess the cartridge, you may be asked to troubleshoot the common cause of defect and in case, you don’t want to do it, you’ll have to cover a restocking fee. For all the non-disputed products (wrong purchase, not interested etc) must be returned in its original condition. If you return the item within 60 days of purchase, then only you can get the refund (excluding shipping cost and restocking fees of 20%).